It is not our collector’s goal, but we have many duplicates of the sheet music ‘Over the Waves’ (Sobre las Olas in Spanish, Über den Wellen in German, Sur les Vagues in French, Sopra le Onde in Italian). 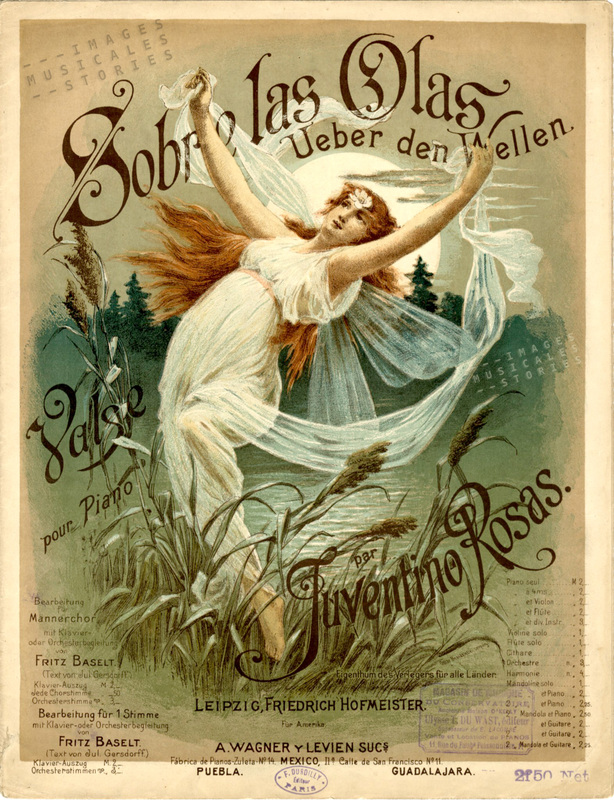 Not surprisingly the waltz, Sobre las olas, has sometimes been incorrectly attributed to Johann Strauss. 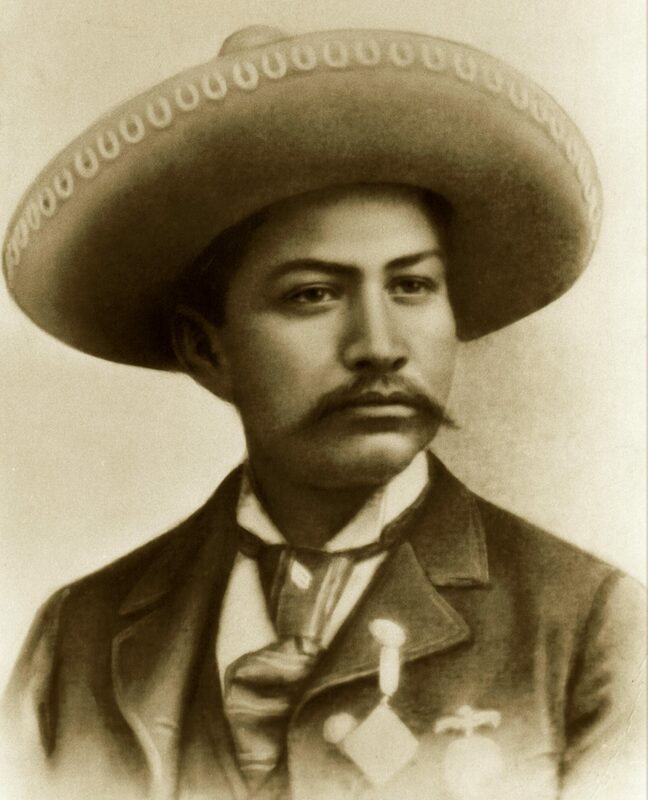 But is was composed by a Mexican, Juventino Rosas (1868-1894). His life has been documented and filmed. Beware though, because many lies and fantasies have been written about him. What is true —and sad— is that he died too young at the age of 26. We want to concentrate on the iconic representation of Sobre las Olas on all the above covers. Where does it come from? Why did the music publishers all over Europe apparently follow the convention to represent a young nymph, fairy or woman floating above foaming water, always with bare arms, twirling and undulating, wrapped in lots of light fabric? Send us a postcard if you know the answer, please. At that time Art Nouveau is in full bloom, and the flowing gowns echo the characteristic whiplash curves employed by many fin-de-siècle artists. What strikes us, is the graphical similarity with the representation of the famous Serpentine Dance created by Loïe Fuller at the Folies Bergère, as seen on posters around 1900. Loïe Fuller, left: by PAL (Jean de Paleologue); middle: by BAC (Ferdinand Sigismond Bach),1892; right: by Jules Chéret, 1897. Of course, seeing Loïe Fuller in action is another thing. Here she is, metamorphosing from a bat, in an original silent film by Segundo de Chomon. He was a brilliant Spanish film pioneer who worked in Paris and is often compared to Georges Méliès, due to his frequent camera tricks and optical illusions. The film is from 1902 (and not 1905 as indicated on YouTube). Although Segundo de Chomon hand painted some copies, this one is recently stencil-coloured. In another Segundo de Chomon film The creation of the Serpentine (1908) Mephistopheles interrupts a peaceful evening of dancing in a French salon. Showing his real face, the demon creates a woman who multiplies in numerous Serpentine dancers, all twisting their robes until they finally explode into flames. Wow! And here is an excerpt from La Danseuse a 2017 biopic of Loïe Fuller, played and danced by none other than I’ll Kill Her Soko. Perhaps not really a must-see, but it gives a good impression of the colour effects that were originally used and designed by Fuller herself. Now back to our Sobre las Olas with an Uzbek interpretation. It surely beats kittens on Facebook. Table of six ‘Sobre las Olas’ sheet music above: (clockwise starting top left) (1) published by Ernst & Paul Fischer (Berlin, s.d. ); (2)published by Alfred Michow (Berlin, s.d. ); (3) published by Adolf Kunz (Berlin, s.d. ); (4) published by Otto June, Leipzig, s.d., illustration signed G.B; (5) published by Anton J. Benjamin (Hamburg, s.d. ); (6) unknown publication. 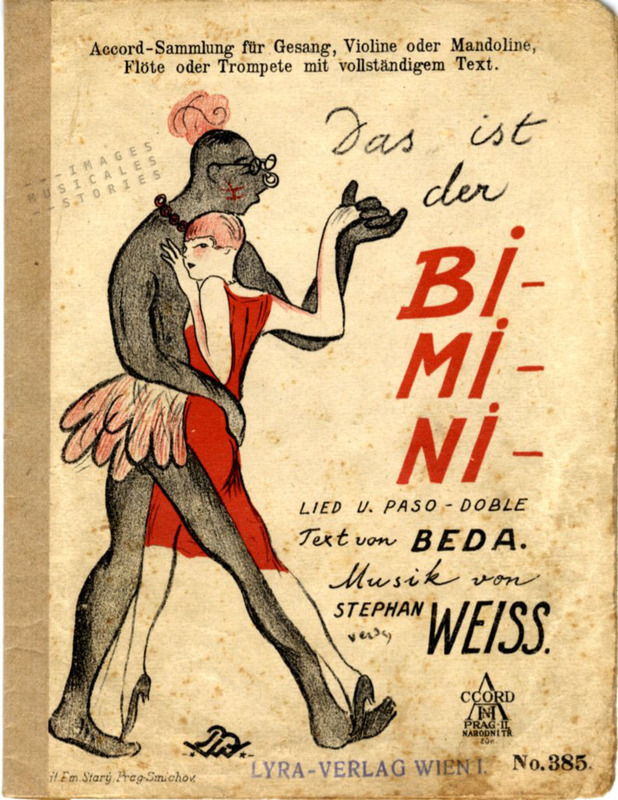 ‘Das ist der Bimini…‘ by Stephan Weiss and Beda. 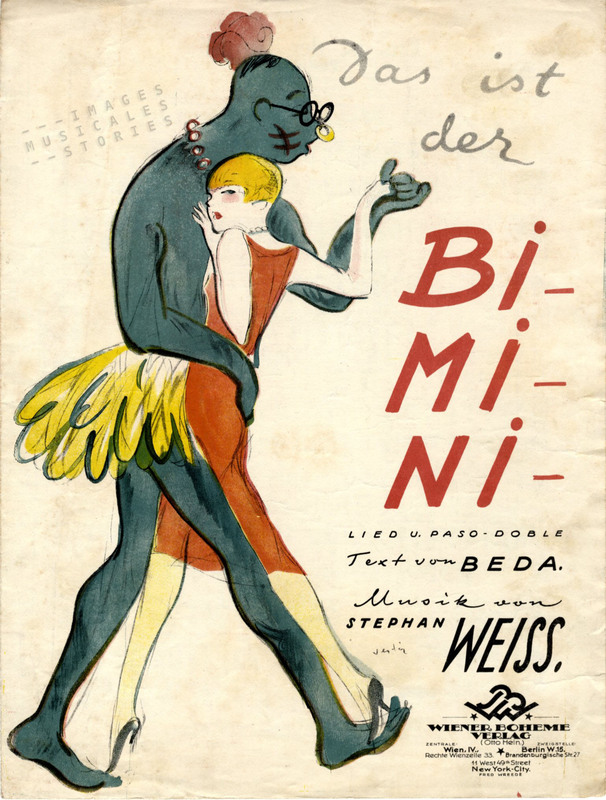 Cover illustrated by Vertès for publisher Wiener Bohème Verlag (Wien, 1925). Amusing double items, over the years we have grown to cherish these lucky finds. All of the graceful flavours of print and design become apparent: subtle similitudes, minor mistakes, lost details, delicate varieties in shade, colour or contrasts. However sometimes a duplicate is nothing but a gross replication. Take for instance the small Czech songbook, that would like to be an exact copy of the over-the-top incorrect but oh so cute Vertès illustration. A mediocre but bleak reproduction if you ask me. ‘Das ist der Bimini, Accord-Sammlung für Gesang’, published by Accord in Prague (1925?). 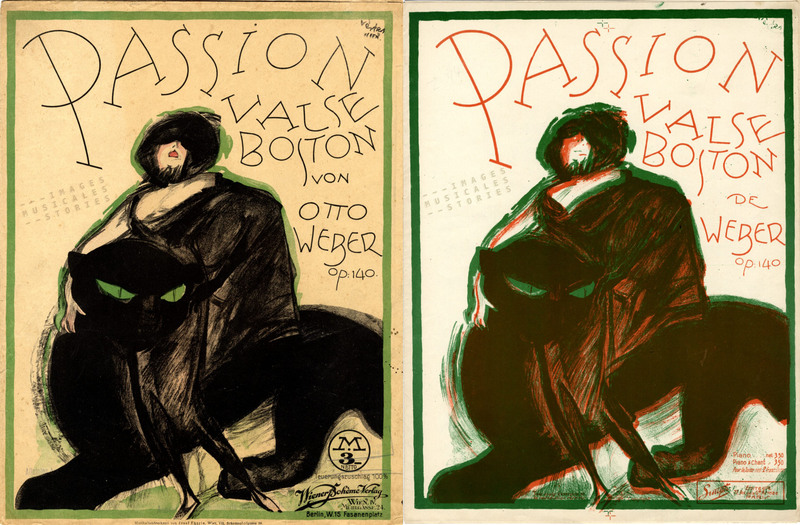 ‘Passion‘ a boston waltz by Otto Weber (1920). The cover illustrated by Marcel Vertès was published by Drei Masken Verlag in Vienna (on the left) and Smyth in Paris (right). Have a look at a similar debacle, this one from the workshop of Hawkes in London. What happened, was the red ink too thick or too thin? Shouldn’t the gold have been printed first? It may be that the red ‘Gold and Silver’ waltz was an ordinary printing press reject. Which we now ironically give the status of ‘collection item’. Anyway what a shame for the beautiful drawing by W. George. 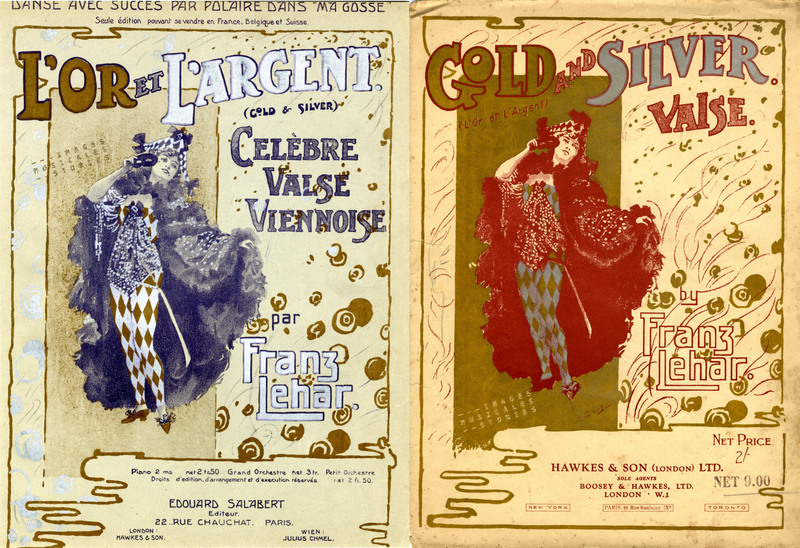 On the left ‘L’Or et l’Argent‘ from Franz Lehar, published by Edouard Salabert (Paris, 1903). Right: ‘Gold and Silver‘, the washout from Hawkes & Son, London, s.d. Illustration by W. George. Some ‘duplicate’ sheet music are just different. Having both versions in the collection is worthwhile, and brings on a few moments of delight. 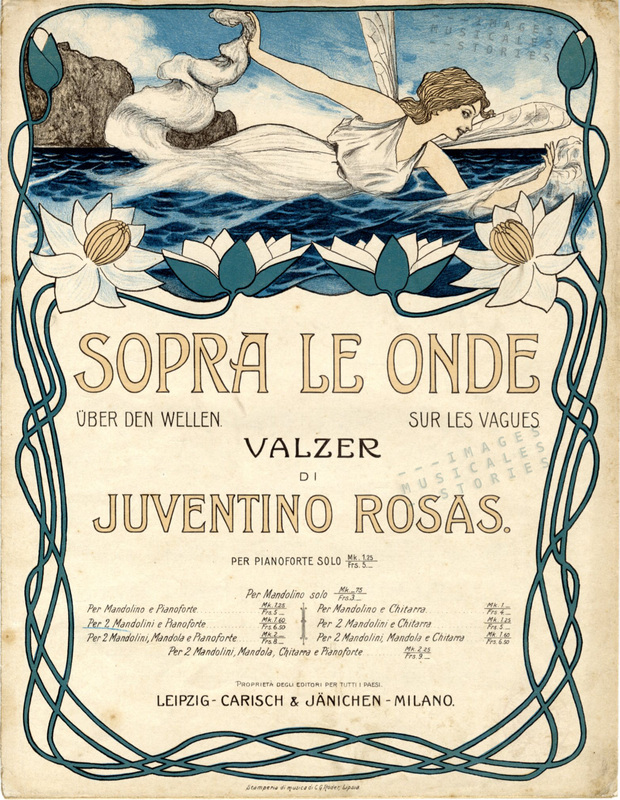 As does the gliding sound of the great-grandmother of all waltzes ‘Sobre las Olas’ (Uber den Wellen, Sur les vagues, Over the Waves) composed by Mexican Juventino Rosas in 1888. 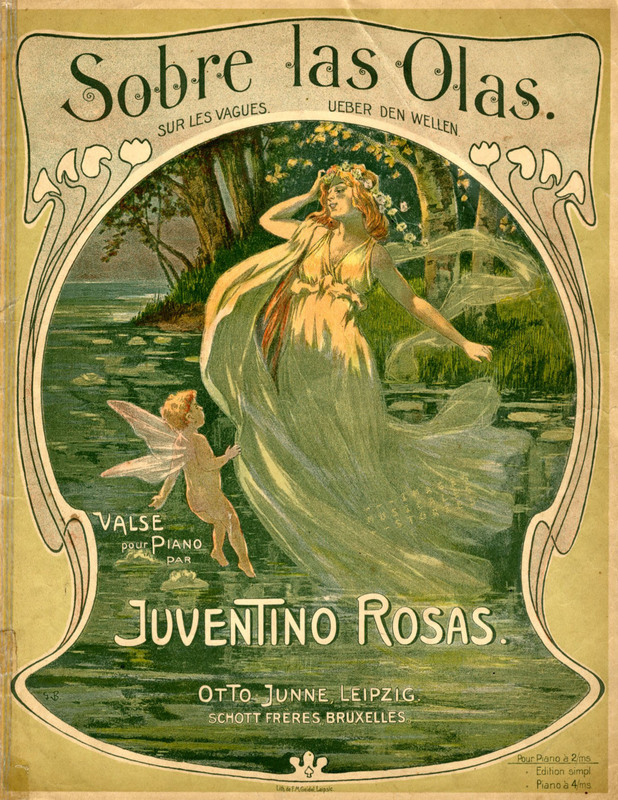 ‘Sobre las Ollas‘ by Juventino Rosas. Published by Otto June (Leipzig, s.d.). Illustration signed G.B. 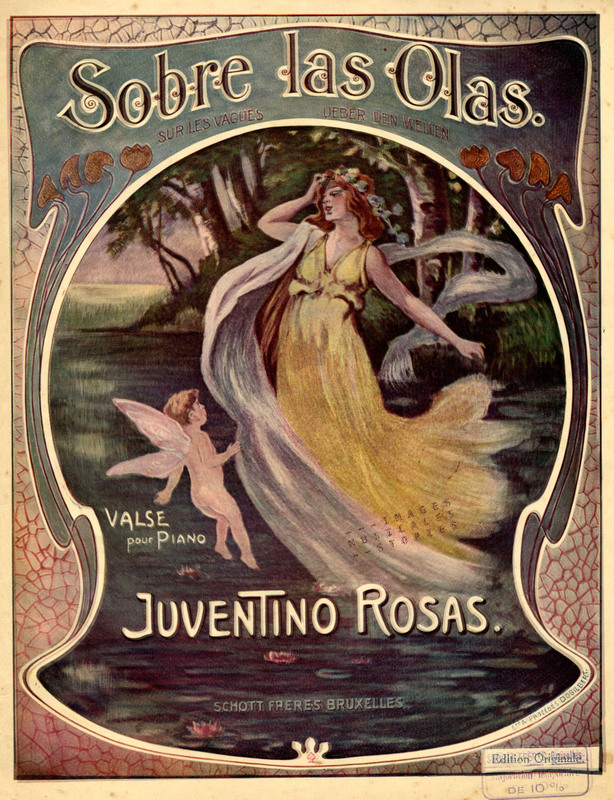 ‘Sobre las Ollas‘, waltz composed by by Juventino Rosas. Publisher: Schott Frères (Bruxelles, s.d.). Unknown illustrator. Time now for a musical intermezzo: float and twirl over the ocean waves! All the duplicates above show essentially the same drawing. It is more fun when the same theme is drawn differently, as with this chucklesome waiter. 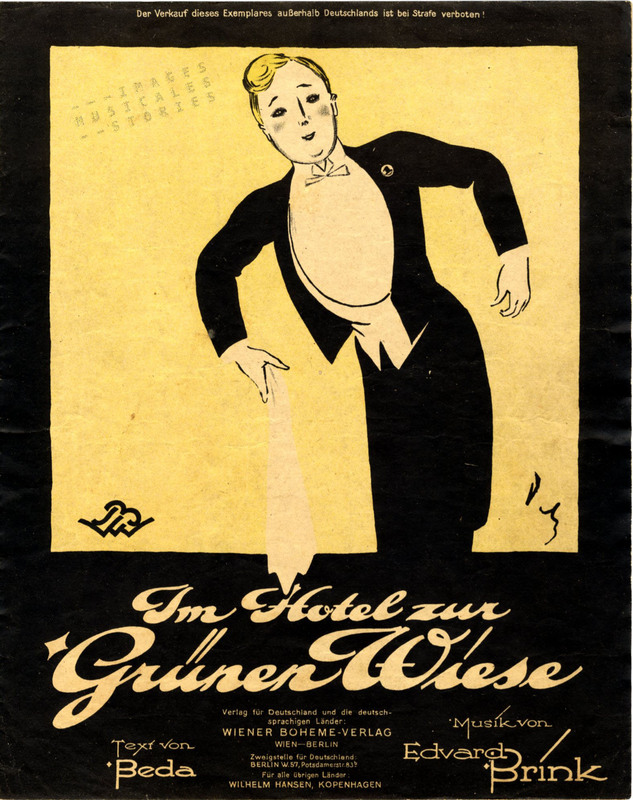 ‘Im Hotel zur Grünen Wiese‘ by Edvard Brink, illustrated by Otto Dely and published by Wiener Bohème Verlag (Wien, 1922). 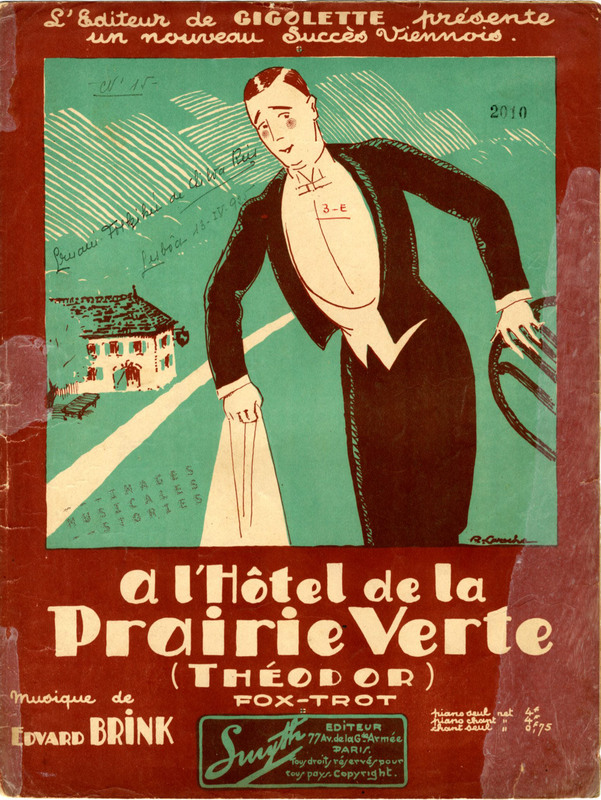 ‘A l’Hôtel de la Prairie Verte (Théodor)’ by Edvard Brink, illustrated by Robert Laroche (published by Smyth, Paris, 1922). A last surprising duplicate which brings joy is The Teddy Bears’ Picnic. 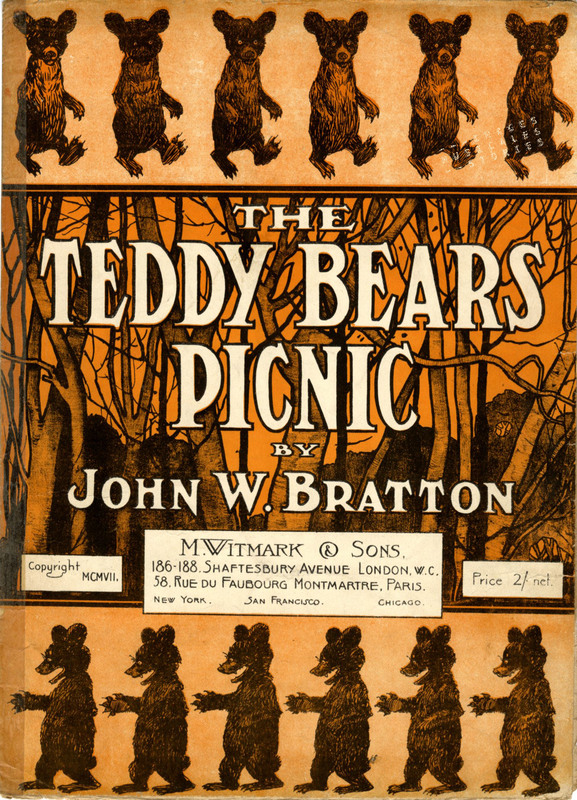 ‘The Teddy Bears Picnic‘ by John W. Bratton. Illustrator unknown. Published by Feldman & Co (London, s.d.). The UK branch of American publisher Witmark resolutely chose for an extra row of bears. 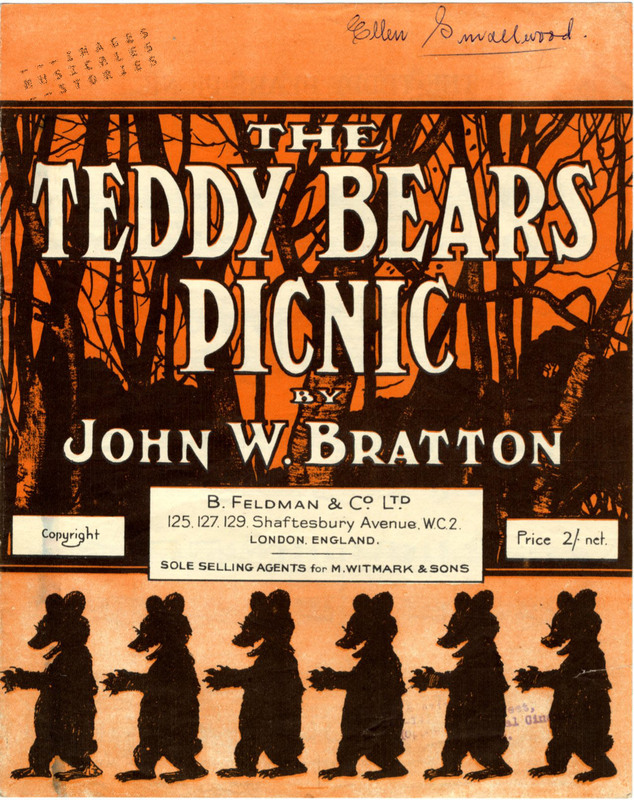 ‘The Teddy Bears Picnic‘ by John W. Bratton (Witmark & Sons, London, 1907). Unknown illustrator. German publisher Roehr on the other hand preferred chubby Teddies for its Baby-Bären Parade. 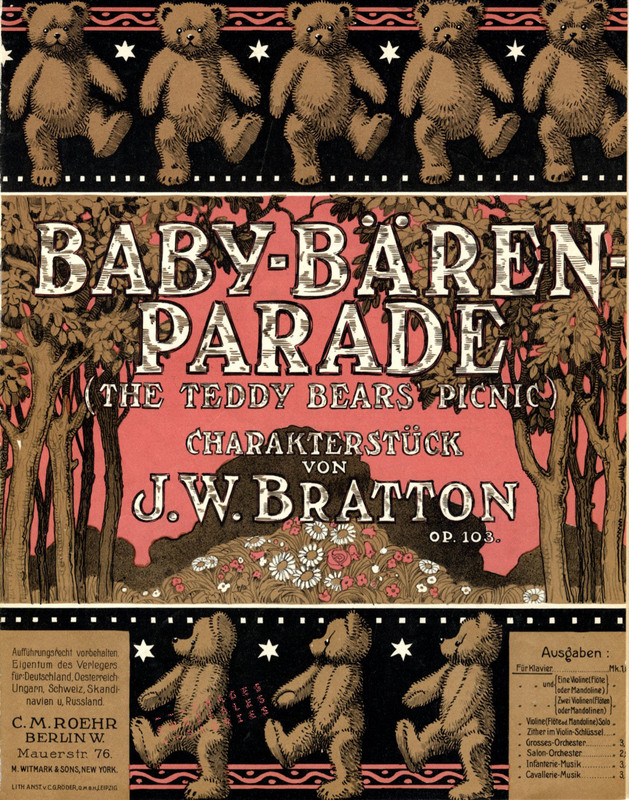 ‘Baby-Bären Parade – The Teddy Bears Picnic‘ by John W. Bratton. Cover of the sheet music published by C. M. Roehr (Berlin, 1907). Now comes the special moment: a scene from the Eighty’s serial drama The Singing Detective, wherein Michael Gambon plays crooner, detective, and psoriatic patient. Thank you Dennis Potter. 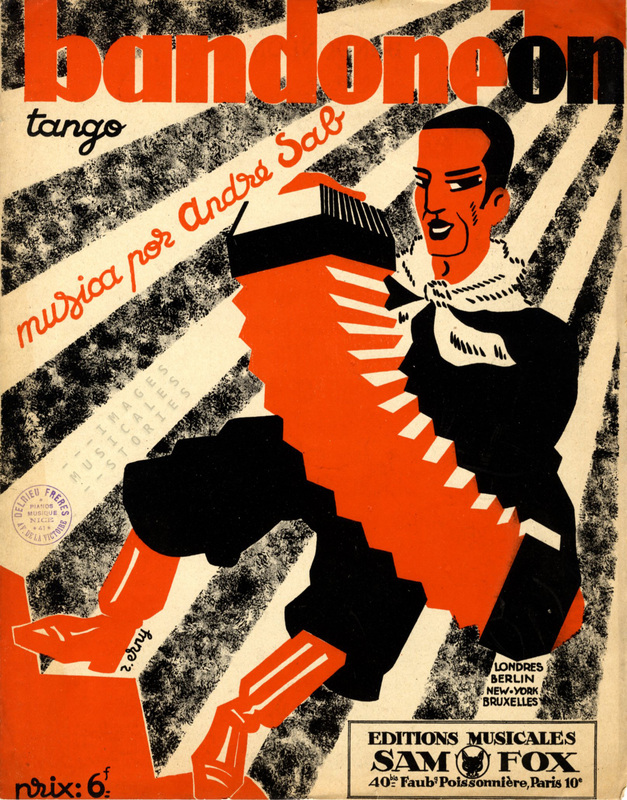 ‘Bandoneon’, tango by André Sab. Published by Sam Fox (1927, Paris) and illustrated by Raymond Erny. A one minute silence. Is there a worthy substitute for written blogs? This short post is dedicated to our friend Bram Huijser who passed away last week at the age of 94. He was a follower of these pages and an enthusiastic collector of books. Bram, born and raised in Amsterdam, was gentle and broad-minded. He kept his wonderful library, especially of children’s literature, in his house in Musselkanaal in the province of Groningen, The Netherlands. Wherever you looked: books and books and books! 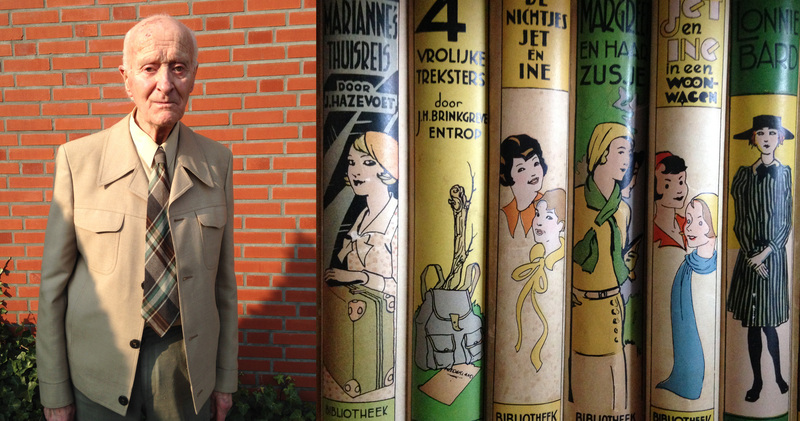 Bram Huijser (1922-2016) and part of his collection of children’s books published by Kluitman (Alkmaar). 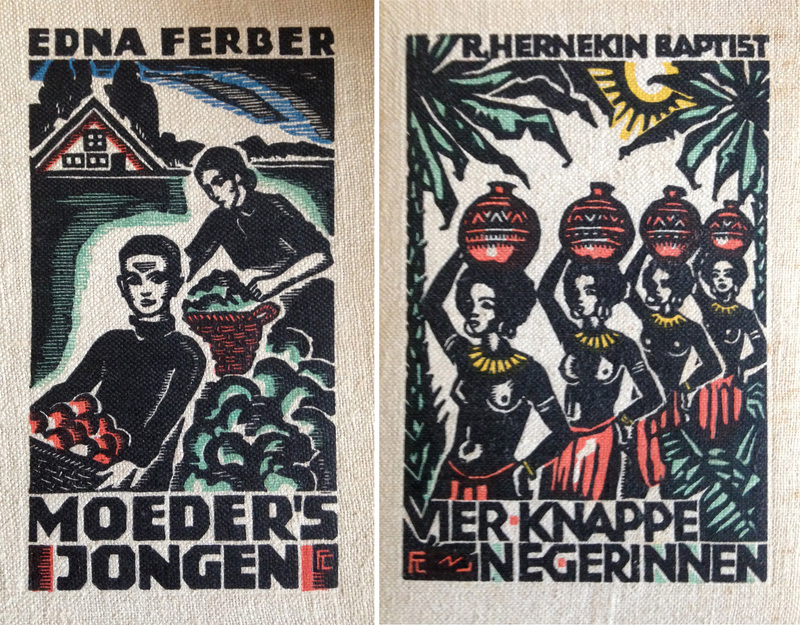 Bram particularly liked —and fervently told us about— the illustrations of Fré Cohen, a Dutch female designer and member of the Workers’ Youth Association. She became one of the favourite designers of the socialist movement. Her life ended tragically in 1943 when she took a lethal pill escaping imprisonment by the Dutch SS who had tracked her down when in hiding. Bram revealed us he met his wife during the war while he secretly delivered the resistance newspaper of the Communist Party De Waarheid (literally The Truth). One of the subscribers was her brother, and that’s how he met Mies. They fell in love and got married after the Liberation. We traded a few sheet music. One of them was a song about children collecting colourful cigar bands, which Bram promptly started to sing with a clear voice. 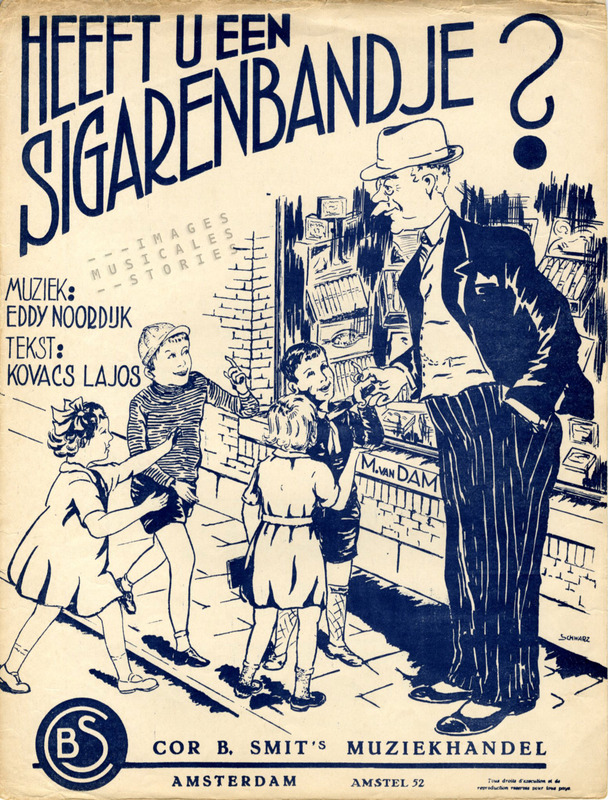 ‘Heeft u een sigarenbandje?’ by Eddy Noorddijk & Kovacs Lajos (Louis Schmidt). 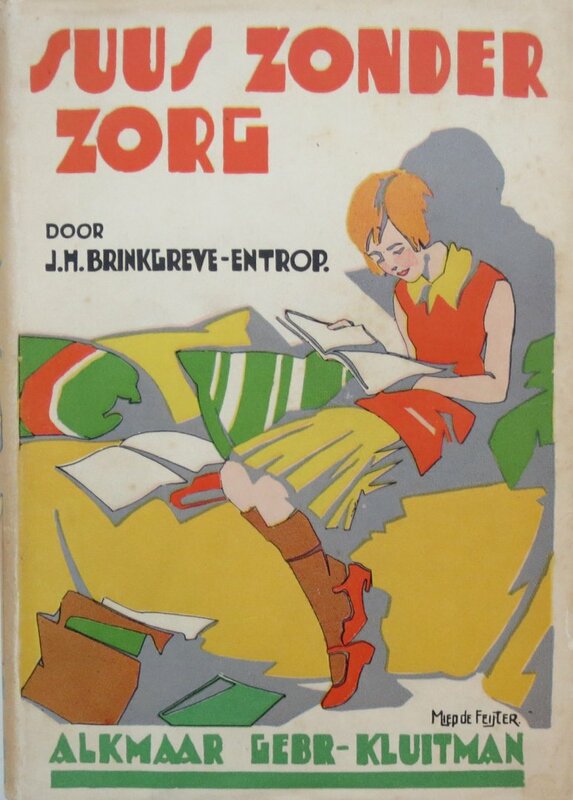 Published by Cor B. Smit’s Muziekhandel, Amsterdam (sd). I remember that Bram liked cats, the bandoneon and traditional music. I thought it a bit odd that he so admired the Flemish television crime drama series Witse. Apart from our love for well-done illustration work, we shared a long-time closeness to the music of The Dubliners and the melancholic folk songs of Wannes Van de Velde, a hippy bard who is world famous in Antwerp. This one is for you Bram!